What are flexor tendons? Tendons connect bones to muscles. The flexor tendons in the hand connect the muscles in the forearm to the bones of the hand. The flexor tendons of the hand bend or flex the fingers into the palm, allowing you to make a fist. Each finger has 2 flexor tendons (FDS and FDP tendons) and the thumb has one flexor tendon (FPL tendon). If the flexor tendon is cut, the two ends of the tendon separate and the patient cannot bend the finger normally. Patients have trouble making a fist or using their hands for many tasks if the tendon is not working properly. What are the treatment options? Prompt diagnosis and early treatment are important. The wound should be cleaned and stitched to help prevent infection. Most hand surgeons recommend surgery to repair cut flexor tendons. This is performed in the operating room within a few days of the injury. If there has been a delay in treatment (more than a couple weeks), repair of the tendons is more difficult. Scar tissue and retraction of the tendons makes repair more complicated. 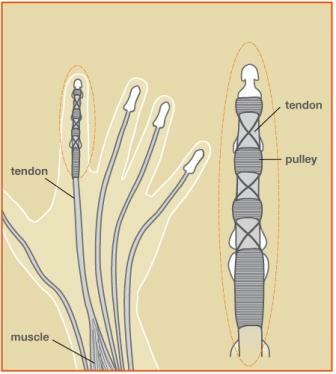 Sometimes reconstruction using a tendon graft is recommended in chronic or delayed cases. What is the recovery after surgery? The skin stitches are usually removed after about 2 weeks. Patients wear a splint for 6 weeks following surgery to protect the healing tendons. Hand therapy is very important after surgery. Frequent hand therapy sessions and home exercises are helpful to reduce stiffness and improve hand strength. Full recovery takes several months, sometimes up to 6 months. Most people gradually regain range of motion and strength following surgery. Occasionally a second surgery is needed to remove scar tissue if the fingers do not move properly due to scarring around the joints or tendons. Important: After surgery, you should not remove your plaster splint or move your fingers until notified. Our therapists will guide you in gentle range of motion exercises to help reduce stiffness in the fingers. The tendon repair can break if these instructions are not followed closely and revision surgery may be required.